It came as sad and surprising news last summer when Larian Studios announced that Divinity composer Kirill Pokrovsky had died. Pokrovsky had created memorable music for all of Larian's games, going all the way back to LED Wars in 1997, and became a Larian “face” through his livestreamed mini-concerts in support of Divinity: Original Sin. He left, as they say, very big shoes to fill. 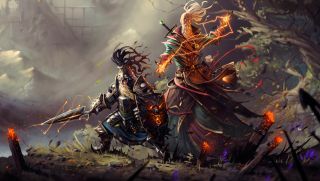 Hear new info about Divinity: Original Sin 2 at the PC Gamer Weekender in London from March 5-6. Click here to find out more. Slavov pays a nice tribute to his predecessor in the latest update video when he says that despite being a long-time fan of Larian's games, he never inquired about working for the studio because he was “so in love with Kirill's music.” The video also includes a clip of Slavov's work-in-progress music playing in the background, but while Larian founder Swen Vincke promised that the new composer has big and surprising ideas for Divinity: Original Sin 2—“super, super, super cool,” as he put it—he said the studio won't reveal any of his work until it's finished. The Kickstarter update also includes a new Skill Tree poll, information about backer rewards, and a note about upcoming appearances, including at the PC Gamer Weekender on March 5 and 6, where Vincke will appear on two panels—one each day—to discuss the development of the new game. If you're planning on being in London for that weekend, you can take a shot at winning some free tickets right here.